Rand Paul’s Patriot Act filibuster: GOP hopeful launches Mr. Smith-style talking filibuster on Senate floor. Sen. Rand Paul speaks at the Defending the American Dream Summit sponsored by Americans For Prospertity at the Omni Hotel on Aug. 29, 2014, in Dallas. The goal of the Mr. Smith Goes to Washington-style stunt is ostensibly to prevent the reauthorization of the George W. Bush-era surveillance law, which is set to expire on June 1. In reality, though, Paul can only delay that legislation, not derail it. He’s conceded that he doesn’t have the votes he needs to prevent the Senate from voting on the bill. Paul can talk as long as he would like to, but ultimately even the most long-winded and big-bladdered senator must rest. Regardless, Paul knows better than most that while old-school, talking filibusters ultimately fail, they rarely go unnoticed. The last time Paul played the part of Mr. Smith, he held the floor for nearly 13 hours in March 2013 to rail against U.S. drone use on American soil, temporarily delaying John Brennan’s confirmation as CIA director and turning U.S. drone policy into a front-page story in the process. The stunt cemented Paul’s status as a civil libertarian hero, while also turning him into a national figure in only his second year in office. The novelty of his filibuster isn’t quite the same this time around, but Paul has a bigger microphone now than he did two years ago. The libertarian-leaning senator is one of six official candidates in a GOP presidential field that could soon balloon to more than 20. Media outlets inside and outside the Beltway are sure to take notice. Grinding the Senate to a halt, meanwhile, lines up nicely with Paul’s “Defeat the Washington Machine” campaign pitch. 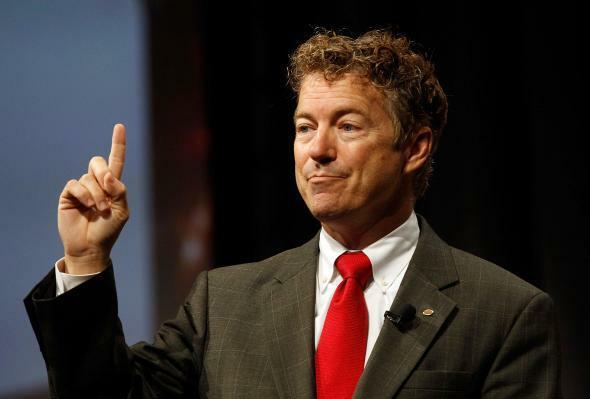 Paul’s opposition to the nation’s surveillance programs won’t make him many friends inside the GOP establishment, but his campaign is built on the idea that such views will help him keep the support of the libertarian-leaning voters who backed his father in previous primaries while also appealing to young voters who are particularly concerned about privacy issues. Paul’s move to make government surveillance a major topic in the campaign will have repercussions for his rivals. Sen. Marco Rubio, for one, believes the Patriot Act is critical to the nation’s efforts to fight terrorism. Sen. Ted Cruz, meanwhile, agrees with Paul that the law is a violation of Americans’ privacy rights. Neither Scott Walker nor Jeb Bush has taken a formal position on the program, but Paul’s stunt means they very well may need to in the days to come. You can watch the first 10 minutes of Paul’s filibuster below, follow along live on C-Span, and keep tabs on whether Paul has the lung and bladder control needed to crack the list of the 10 longest talking filibusters in Senate history. Note: Since Paul began talking in the middle of an unrelated matter (the trade deal with Asia), there may be some dispute whether his current stunt is officially a filibuster or not. I’ll leave that for the Senate historians to sort out, but, regardless, his intent is clear.